Last summer, when my friend and now partner-in-crime Sam approached me about joining her at Swoon, one of the topics that came up was surviving/thriving as a working mama. At the time, Sam was pregnant with her first child, in her final trimester, about to enter an entirely new phase of her life while at the helm of a growing business. Suffice to say, she was at a major crossroads. Being a dear friend, she also knew that I was pretty darn close to complete and total burn out. I loved my job at D, loved being an editor, but the whole writing three blogs/producing a quarterly magazine with only one other person/serving as market editor for another bimonthly publication was starting to take its toll. I was tired, mildly irritable, and definitely stressed. But most distressing was the fact that I was starting to feel like, well, not exactly the world's #1 mom. Oh and the best part? My current job was overseeing a magazine focused on how to be a more balanced/happy/inspired mother. Sam and I knew that there wasn't a magic bullet, no working mother panacea, and, as sad as it is to admit, more than likely no such thing as work/life balance. But we also had a hunch that there was a better way... I mean there had to be, right? I've been at the studio for nearly eight (!) months now... Our crew includes seven employees, three dogs, and, occasionally, two girlies (mine) and a dreamy, dimpled baby boy (Sam's). (And apparently we're not alone). Our days consist of strategizing, dreaming, designing, making, schlepping, hauling, and sometimes a little drinking and dancing. In between, we dash out for parent reader and pediatrician appointments and school performances, and we try our darndest to stay sane while doing it (see the drinking and dancing). Some days we pull it off. Some days, well, not so much. But we at least know we're taking a stab at that better way. It's a start. And that's enough for me. You are a lucky, lucky lady. oh thank you....i've said myself the past year that there is really no work/life balance.....just doing what we can to be the best we can as moms, coworkers etc.... My mantra for the year was to just try and feel more 'love' - which i know sounds a bit 70's but in all honesty it was the only thing that made sense to me - the only thing that would help me feel balanced through all of the crazy and not so calm times...It's a work in progress...thanks again for being so honest! I battle with this daily, after launching my business with a 3 month old, 7 months down the track business is booming and motherhood is amazing. I (only now) discovered that day care for 1 day a week will be HUGELY helpful - work in nap times is wearing thin. One thing the whole experience has taught me, there is no such thing as a need for work/life balance when you are doing what your heart desires. Sometimes that means walking the line between falling flat on my face and moving forward, but the reward or working when and where I want is priceless. Wow, as a first time mom with a six month old, I can't imagine trying to run my own business while taking care of her. I'm just barely keeping up with my two day a week work from home job! I do agree that trying to work during naps is difficult and I hope it will get easier once I can have her in daycare one or two days a week. 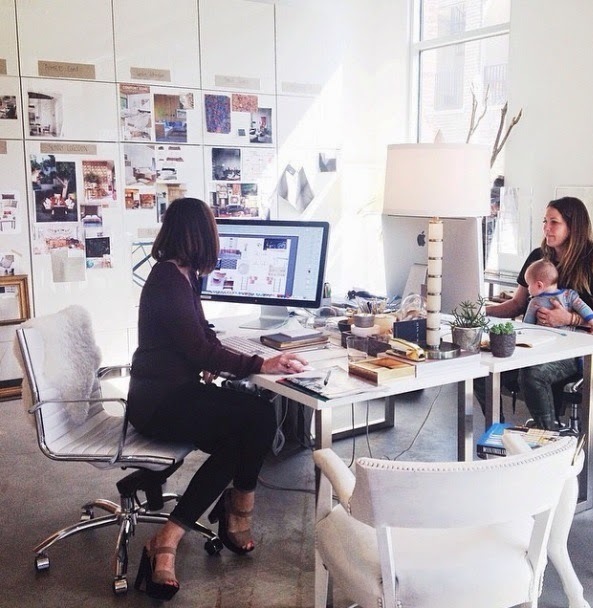 I would love to have a work environment as family friendly as this! I LOVE this pic of y'all! Mr W is the cutest! And I think that it's awesome that you are really living a more "balanced" life - key to happiness right?! We can all hope for the same!